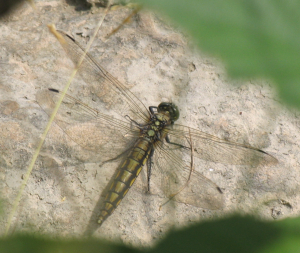 Observation - Dragonfly - Black-tailed Skimmer - UK and Ireland. Description: Clear wings, males has black-tipped blue abdomen, female has yellow-brown abdomen with black, longitudinal bands on the upperside. Beside a forest pool. Clear wings, males has black-tipped blue abdomen, female has yellow-brown abdomen with black, longitudinal bands on the upperside. Beside a forest pool.